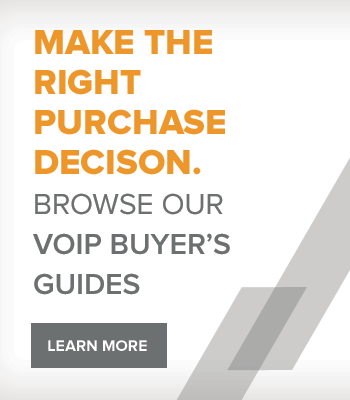 Features call control functions to manage users' incoming/outgoing call schedules, softphone compatibility, and easy USB connections. Like other Sennheiser corded headsets, ActiveGard technology protects your hearing and HD sound with ultra noise cancellation eliminates distractions in loud offices. Built with stainless steel and brushed aluminum, SC Series headsets have second-to-none quality. 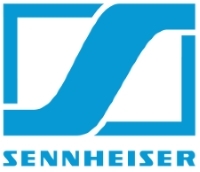 Why buy Sennheiser CC Series Headsets? 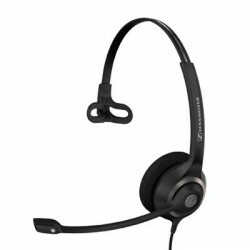 The Sennheiser SC 230 is a single ear wideband corded headset that has been designed for call-center environments. The SC 230 features a pivotable boom noise cancelling microphone that helps remove background noise and CircleFlex technology for a custom fit all day long. 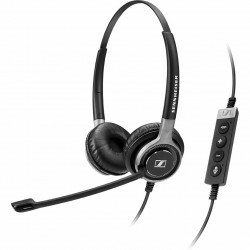 The Sennheiser SC260 Dual Wideband Headset is a dual ear wideband corded headset that has been designed for call-center environments. The SC 260 features a pivotable boom noise cancelling microphone that helps remove background noise and CircleFlex technology for a custom fit all day long. Built to withstand the rigors of the toughest of call center and office usage, the Sennheiser SC660 USB CTRL Professional Mono Headset is a single-ear, all-day use headset that has been designed for quality-conscious contact center and office professionals. Offering great functionality, the SC660 USB CTRL can easily allow any user to manage their incoming/outgoing call schedule with HD quality audio. 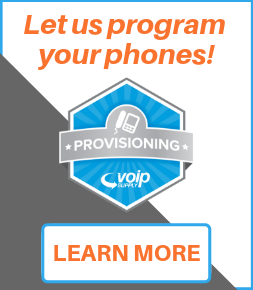 This premium wired headset works extremely well with any UC or softphone communications. 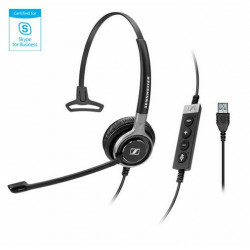 Built to withstand the rigors of the toughest of call center and office usage, the Sennheiser SC630 USB ML Professional Mono Headset is a single-ear, all-day use headset that has been designed for quality-conscious contact center and office professionals. Offering great functionality, the SC630 USB ML can easily allow any user to manage their incoming/outgoing call schedule with HD quality audio. 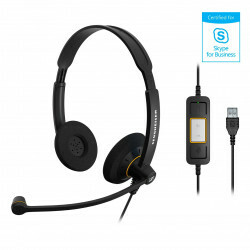 This premium wired headset is Certified Skype for Business, Softphone compatible, and also contains call control. 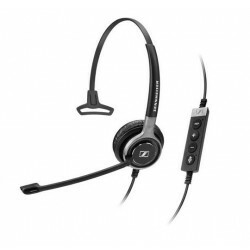 Built to withstand the rigors of the toughest of call center and office usage, the Sennheiser SC660 USB ML Professional Dual Headset is a dual-ear, all-day use headset that has been designed for quality-conscious contact center and office professionals. Offering great functionality, the SC660 USB ML can easily allow any user to manage their incoming/outgoing call schedule with HD quality audio. 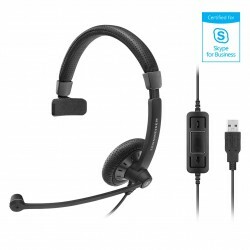 This premium wired headset is Certified Skype for Business, Softphone compatible, and also contains call control. 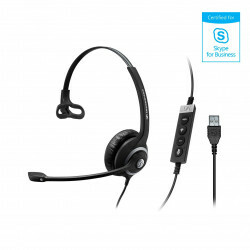 Sennheiser Culture™ SC 30 is a Monaural headset that provides smooth USB connectivity for use with Skype for Business. It features wideband audio and an integrated call control unit. 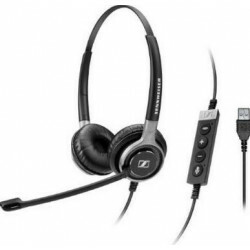 Sennheiser SC 60 USB Duo Headset is compatible with Microsoft Lync and features wideband audio. Sennheisser's SC 60 USB is the perfect UC solution for your Skype for Business environment. Sennheiser SC 40 USB MS Mono Headset is the right solution for those who appreciate crisp voice clarity and professional comfort. 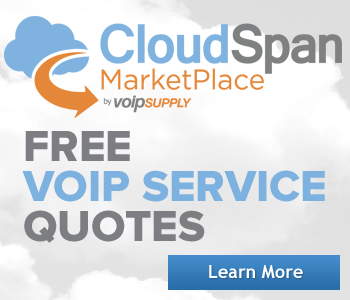 The SC 40 is certified with Skype for Business. 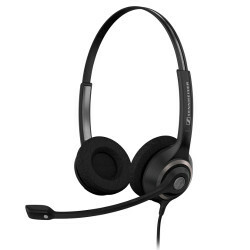 Part of Sennheiser's Circle Series, the SC 230 USB MS II is a dependable single sided corded headset with an in-line control unit that has been certified for use with Skype for Business. Built to withstand the rigors of the toughest of call center and office usage, the Sennheiser SC630 USB CTRL Professional Mono Headset is a single-ear, all-day use headset that has been designed for quality-conscious contact center and office professionals. Offering great functionality, the SC630 USB CTRLcan easily allow any user to manage their incoming/outgoing call schedule with HD quality audio. 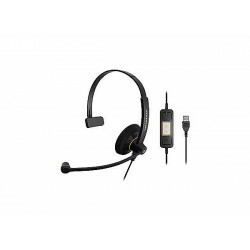 This premium wired headset works extremely well with any UC or softphone communications.